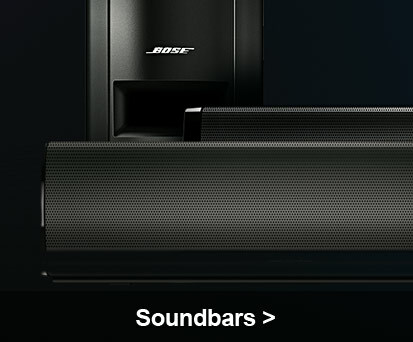 How does a soundbar no longer than a ruler create such a wide soundstage? 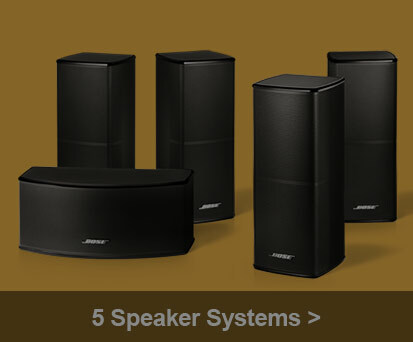 The four-element speaker array inside works with Bose® TrueSpace® signal processing to spread sound well beyond the speaker itself. The effect is more like being in a cinema, immersed in the action. And if you're playing a video game, the virtual world becomes even more real. 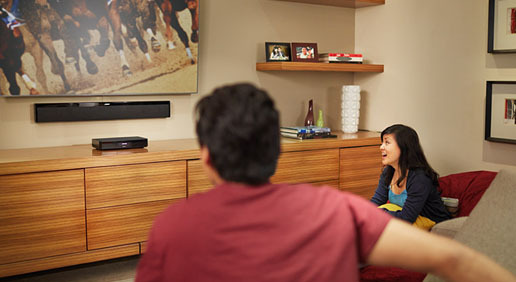 Among soundbar speakers, this little specimen performs well beyond its size. 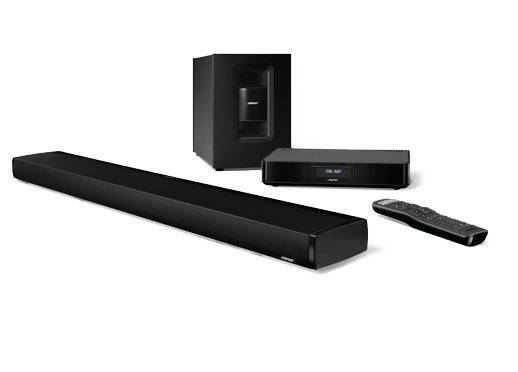 While you're enjoying the newfound clarity and spaciousness the CineMate® 15 system brings you, you'll also notice something entirely new—sounds you can feel. 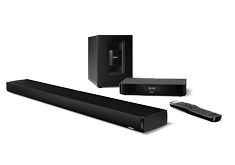 From the pulsating rhythm of a bass guitar to the dramatic effects of an action movie, you'll finally discover the low notes your HDTV couldn't come close to reproducing. 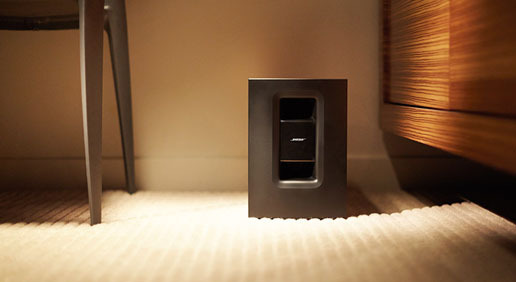 All from a hideaway Acoustimass® module you can place almost anywhere in the front of your room, even behind furniture. 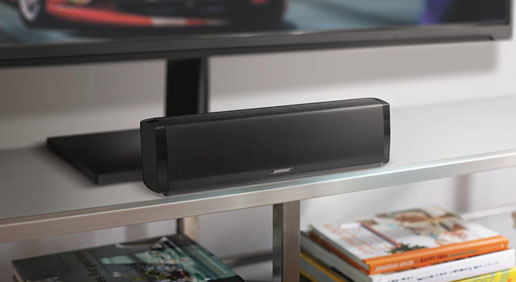 Looks can be deceiving, especially when it’s a soundbar speaker that measures less than half a meter. 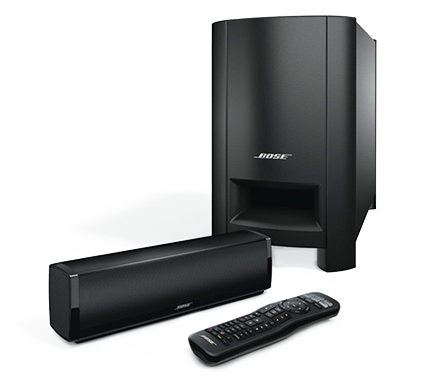 But give it a listen, and you’ll find the CineMate® 120 system packs a lot of punch into its space-saving frame. 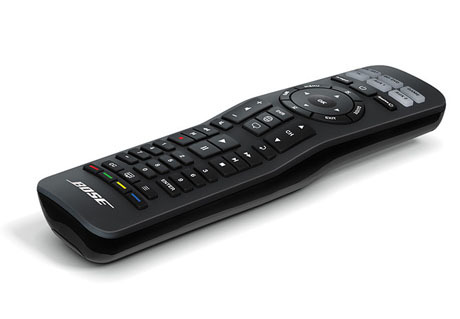 (It fits in nicely with your HDTV, too.) It’s a great choice for an average-sized living room or bedroom. You’ll enjoy detailed sound, spaciousness and a level of performance that belies the speaker’s size. 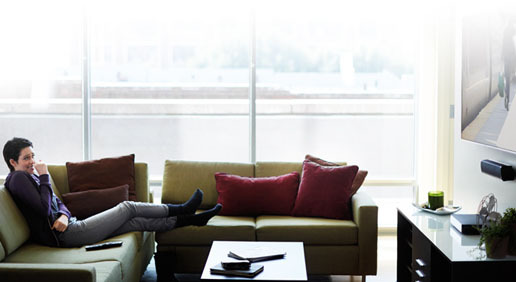 While you're enjoying the newfound clarity and spaciousness the CineMate® 120 system brings you, you'll also notice something entirely new—sounds you can feel. 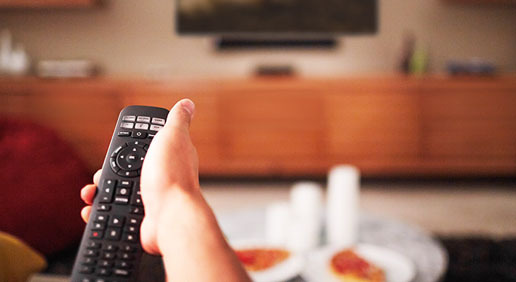 From the pulsating rhythm of a bass guitar to the dramatic effects of an action movie, you'll finally discover the low notes your HDTV couldn't come close to reproducing. All from a hideaway Acoustimass® module you can place almost anywhere in the front of your room, even behind furniture. It provides access to a world of music and let's its users easily choose a convenient preset. So users can enjoy music more effortlessly than ever before. 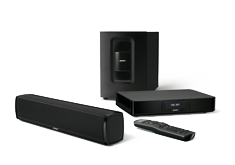 Users can add any other SoundTouch™ product for a multiroom experience and enjoy different music in different rooms,the same music in every room or even create custom zones to play what they want, where they want. 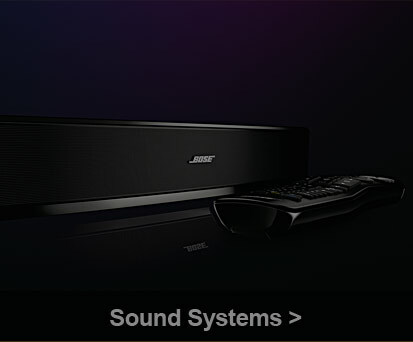 Supercharge your world of entertainment with stunning, immersive sound—the kind of sound you want for the big game, that hot new release, and everything else you love to watch. 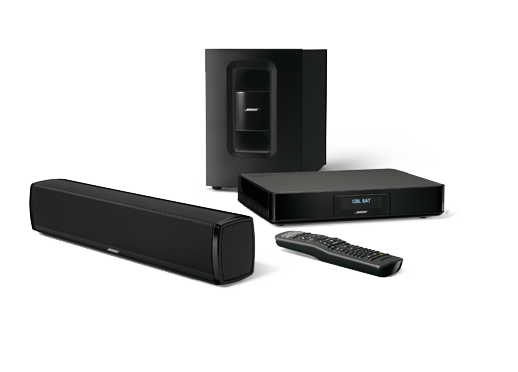 The stylish CineMate® 130 speaker has a ton of technology packed in its slim frame, offering a level of performance you might expect from a five-speaker system. 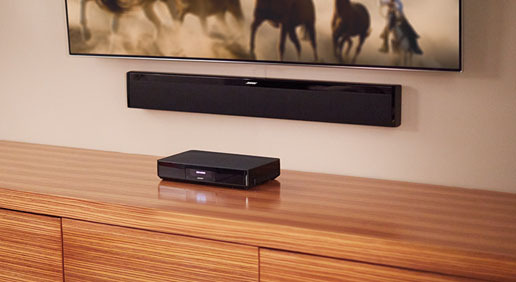 The soundbar takes center stage, but the wireless Acoustimass® module does plenty of work behind the scenes. It adds dramatic low notes to all your entertainment—without adding a cable connection from the module to the speaker. With a signal range over 9 meters, you can place it pretty much anywhere in the room, even out of sight. 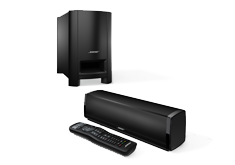 The CineMate® 130 system is designed for flexible speaker placement without compromising the sound. 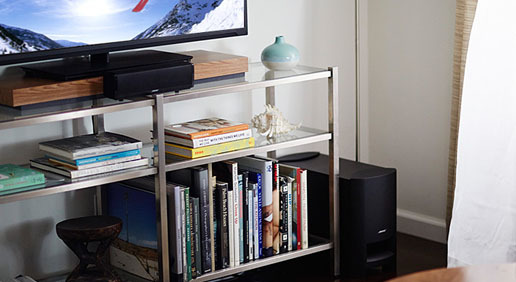 Lay the speaker flat on your entertainment stand or flush-mount it on a wall with our optional wall-mount kit. Proprietary Flexmount® technology detects the speaker's orientation and adjusts the audio processing to ensure optimal sound however you position the speaker.